The beauty amongst scale airplanes. 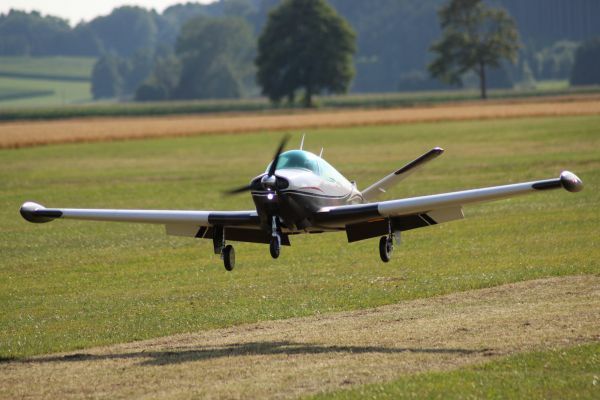 The Beecraft Bonanza is one of the most remarkable small aircraft ever build. It was designed back in the 1940ties and started mass production in the 50ties. The V-teil gives it a very prominent appearance. Actually it is the aircraft with the longest history of serial production, more than 70 years now. In total more than 17.000 have been produced. In the history of the plane it made also some negative news. Several very famous people crashed with it. But nevertheless today it is a still very comfortable and good flying airplane. The history of the plane and its great look in the air inspired us at Tomahawk Aviation to develop a scale version of the Beechcraft Bonanza. We chose a scale of 1:2,87 to give it a reasonable size. It has a wingspan of 3,55m. The model turned out as very beautiful replic of the orginal andin the air a few meters aways it is very hard to distinguish it from the original. This is what we were looking for. On the ground it offers a great deal of detail and a marvellous finish. We are convinced that it will please even the most critical scale enthusiast. The kit is produced as an FRP/CRP sandwich construction either in white or optional painted in the mold. The model weighs under 25kg and is very stiff and robust. The limit for menouvres is more the engine and not the cell. The model comes with a tri-cycle landing gear and can be equipped with electric brakes. The wheel wells are being closed with a total of 6 gear door, as scale as possible to the original. We offer as an option a full lighting set including landing light. We also offer tip tanks and a scale cokpit. The fuslage can be accessed by the large doors. The model is designed for a 3W 4 Cylinder engine with 140ccm with electric starter. But it can also be equipped with an electric power system. Related links to "Bonanza V35 full composite kit white"